This summer, Croatia is due to become the 28th member state of the European Union. But how do Croatians feel about EU membership? Renata Franc, Vanja Medjugorac and the project MYPLACE team report that support for EU membership in Croatia has fallen dramatically since accession negotiations began in 2003. They attribute this fall in support to the lack of public debate about joining the EU, as well as poor information and stereotypes about how the EU functions. Croatia is due to become the 28th member of the European Union on 1 July, subject to the ratification of its Accession Treaty by current members. But how have attitudes towards the EU changed in Croatia since the country applied for membership a decade ago? While a majority of Croatians support joining the EU, this sentiment has fallen significantly since 2003. Understanding changes in Croatian public opinion towards the EU requires taking into account concrete events at specific times: so called situational variables. As Figure 1 below illustrates, the early 2000s were marked by 70-80 per cent of the Croatian public supporting EU membership. This began to decline after Croatia began accession negotiations in 2003, and may well be linked to both the largest single enlargement of the EU (in May 2004), and the fact that negotiations were conditional on Croatia’s full cooperation with the International Criminal Tribunal for the former Yugoslavia. During this period, the share of Croatian citizens which were against EU accession more than doubled: from 20 per cent in the middle of 2004 to 48 per cent in the middle of 2005. Source: GfK Hrvatska – Omnibus. .
By mid-2005, Eurobarometer surveys showed that Croatians had become the greatest Eurosceptics in Europe, after the UK. Surveys and focus groups showed that an important determinant of this Euroscepticism among Croatian citizens was their perception of the EU’s political relationship with Croatia. The most common argument against the EU that participants mentioned (p.59) was the perceived “unfair treatment of Croatia during the accession process”. These attitudes were to a large extent influenced by relationships between the country and the International Criminal Court in The Hague, as well as by bilateral disputes with neighbouring EU members: Slovenia (about Piran Bay) and Italy (about the Ecological and Fisheries Protection Zone). EU negotiations were unblocked in October 2005, after a positive report by UN chief war crimes prosecutor Carla Del Ponte concerning the country’s cooperation with the International Criminal Tribunal for the Former Yugoslavia. 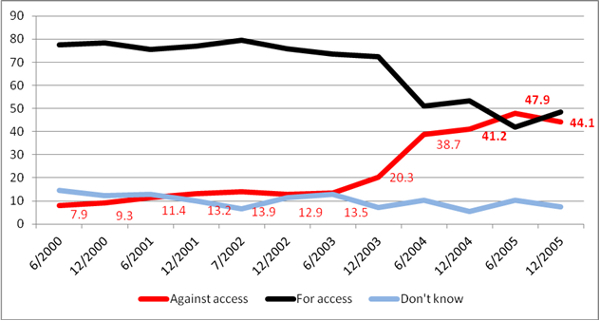 Against this backdrop, the share of citizens which were against accession remained fairly stable until July of 2007 (as shown in Figure 2). Eight years after applying for EU membership, and after almost six years of negotiations, Croatia signed an accession agreement with EU in late 2011. Soon afterwards an EU membership referendum took place. Out of the 43.5 per cent of Croatian citizens that participated, 66 per cent voted for joining the EU, while 33 per cent voted against. Since negotiations began, almost all Croatian parliamentary political parties, and Croatian governments, have been strongly in favour of EU accession. In contrast, since 2004, between 30 per cent and 50 per cent of Croatian citizens have been against joining the EU. Nevertheless, Croatian politicians have continuously ignored this part of public opinion. This wilful ignorance has meant that there has been very little public debate about EU membership, and there has been no comprehensive and concrete information about the possible consequences of joining the EU. As a result, Croatian citizens’ knowledge of the EU has been quite low. For example, a survey from as recently as 2011 showed that about 87 per cent of citizens considered that they were not informed enough about the EU, while more recent data (collected after the referendum) showed that only 15 per cent of citizens considered themselves to be well informed about the EU. Accordingly, several studies and authors have identified this lack of information, Croatian citizens’ relatively poor and stereotyped knowledge about how the EU functions, and their insufficient understanding of the real consequences of entering the EU, as some of the main sources of Euroscepticism. Additionally, studies have confirmed that a lack of trust in the national government, alongside dissatisfaction with the government’s performance and the economic situation, are important determinants for Croats’ negativity towards joining the EU. 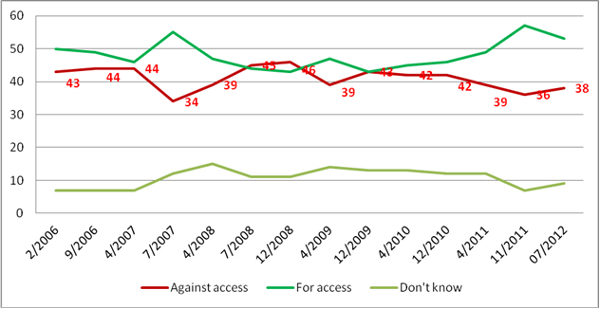 In contrast, socio-demographic characteristics were confirmed as very poor determinants of attitudes towards accession. Several interconnected issues can therefore be singled out as the main sources of Croatian citizens’ Eurosceptic attitudes: the lack of information about the EU and the real consequences of accession; issues largely related to Croatian sovereignty, identity, and preserving the Croatian language and culture (symbolic threats); and issues concerning the possible economic exploitation of citizens and resources. These perceptions are connected to the notion that the EU as an association is characterised by unequal power, with huge differences in influence between states which are “strong and rich”, and “weak and small”. It is also connected to overall mistrust towards the EU political elite and Croatian politicians, who are perceived as being unable to protect Croatian interests. The perceived lack of readiness for Croatia’s entry into the EU is another important factor that has intensified Croatians’ existing fears. Economic concerns have also been intensified by the current global and local economic situation. Although there has been a lack of systematic research about the potential changes in the sources of Euroscepticism during this time, some findings have shown that the perceived threat to national identity has become less important, while economic threats have become more important. This post is part of a collaboration between British Politics and Policy, EUROPP and Ballots & Bullets, which aims to examine the nature of euroscepticism in the UK and abroad from a wide range of perspectives. Dr. Renata Franc is a senior research fellow at the Ivo Pilar Institute for Social Sciences in Zagreb, Croatia and Associate Professor of Social and Political Psychology, University of Zagreb. She is the principal investigator on project ‘Social attitudes and intergroup relationship in Croatian society’ (2007-) funded by the Croatian Ministry of Science and member of the Croatian team in the EU-research project MYPLACE (“Memory, Youth, Political Legacy and Civic Engagement”).Her research interests include social attitudes, prejudices, social identity, civil activism, quality of life and survey research. Vanja Međugorac, is a research assistant at the Ivo Pilar Institute for Social Sciences in Zagreb, Croatia and PhD student at the University of Zagreb.He is asistent on project Social attitudes and intergroup relationship in Croatian society’ (2007-) funded by the Croatian Ministry of Science and member of the Croatian team in the EU-research project MYPLACE (“Memory, Youth, Political Legacy and Civic Engagement”). His interests range over a wide area of social psychology with particular focus on environmental issues. Croats are dissapointed with the EU even before they become a member.Our politicians are a bunch of corrupt commies that have been lying to us for years.Croats are fed up with them as well as the EU.